In the olden days – about 15 years ago when Windows 95 first arrived on the scene – creating a home network was a fearsome task reserved for the knowledgeable or the courageous. That’s no longer the case. Windows XP makes setting up a network easy. The toughest part of the deal is physically installing the hardware; the software side is a minor operation. Share printers, CD-ROM drives and other removeable drives between the computers. Eliminate SneakerNet (passing files around on floppy or CD) and share files directly between PCs. Share a single Internet connection between computers (provided your agreement with your ISP allows this type of sharing). Store only a single copy of large files, saving space on the other PCs’ hard drives. 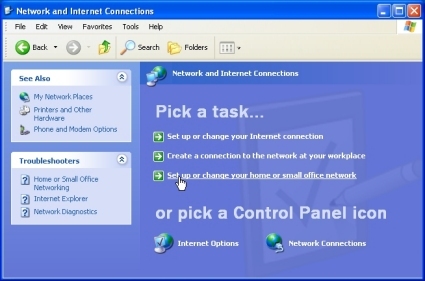 You can network computers that run different operating systems, but you’ll find the ideal networking setup for a small home LAN (local area network) is with XP running on your most powerful machine(s) and either Windows 98 or Windows Me running on the other computers. I don’t recommend trying to include computers running Windows 95 in your network unless you are an experienced user. Take stock of your existing hardware. If you wish to share an Internet connection using Internet Connection Sharing (ICS), choose which computer will be your ICS host. Decide what type of network technology you wish to use. Make a list of the hardware you need for each computer. Install the network adaptors and install your modem on the ICS host computer. Physically cable the computers together. Switch on all computers, printers and other peripherals. Make sure the ICS host is connected to the Internet. Run the Network Setup Wizard on the ICS host. Run the Network Setup Wizard on the other computers on the network. Let’s take that step by step. Note each computer’s location and its hardware, including peripherals such as printers and modems. If you wish to share an Internet connection between your computers using Internet Connection Sharing (ICS), choose which computer will be your ICS host. The ICS host has a direct connection, either by dial-up modem or high-speed link, to the Internet and provides access to the Internet for other computers on the network. Ideally, the host should be a computer running Windows XP. I’ll assume you have made this choice in the following steps. Apart from XP’s easy handling of ICS, by using an XP computer as your ICS host you get the benefits of using the Internet Connection Firewall. The most common choices are Ethernet and wireless LANs. For an Ethernet LAN you will need to install a network interface card, or NIC, in each computer and run cabling between the computers. If you don’t like the idea of opening your computer to install a network card, look for a USB adaptor instead. Depending on the size of your network, you may also need a network hub or router to provide interconnection between PCs on the LAN. Two PCs can get by using an RJ-45 crossover cable; three or more computers require a hub or multi-speed hub (called a switch). If you have a high-speed Internet connection, a high-speed router is a good option. The Network Setup Wizard includes links to detailed advice about configuring your network, including help on designing a network layout to suit your home. If you opt for a wireless LAN, you’ll also need a NIC for each PC (there are versions which use USB adaptors as well). The big benefit for home environments is that a wireless LAN does away with the need for cabling. On the down side, though, wireless LANs tend to be slower, less robust and appreciably more expensive than traditional Ethernet LANs. In particular, wireless LANs do not always live up to their stated working range, and you may find factors such as your home’s construction and design, plus interference from other devices affect your wireless LAN’s performance. You may need to add an expensive Access Point to extend the range of the LAN and, even so, it may not be sufficient. The bottom line is, if you decide to go the wireless route, make sure the store will refund your money if the LAN will not provide reliable performance within the specified range. Make a list of the hardware you need for each computer, not forgetting any cabling, and buy it. If you’re a little dazzled by the choices and configurations, consider purchasing a networking kit. These kits contain all you need to set up a two- or three-PC network. If possible, look for hardware which features the Windows XP Logo, indicating it is fully compatible with XP. Install the network adaptors and install your modem on the ICS host computer (you can also let the computers connect to the Internet independently by installing modems on each). Physically cable the computers (and hubs or routers) together. Of course, you won’t need to do this if you’ve chosen to go the wireless route. If you’re installing an Ethernet network and have a lot of cabling work to do, you may prefer to get a professional to come in and do this work for you. It won’t be cheap, but you can be sure you get the job done correctly and hopefully with minimal damage done to walls, ceilings and floors. Go to the ICS host computer and make sure it is connected to the Internet. To run the Network Setup Wizard on the ICS host, click Start -> Control Panel -> Network And Internet Connections -> Setup Or Change Your Home Or Small Office Network. Follow the instructions in each screen and press Next to continue. 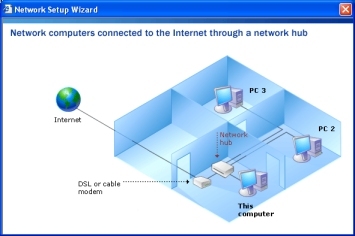 XP's Network Setup Wizard takes much of the pain out of setting up a home network. Configuring your network adaptors (NICs). Configuring your computers to share a single Internet connection. Sharing the Shared Files folder. Any files in this folder will be accessible to all computers on the network. Installing the Internet Connection Firewall to guard you from online attacks. Insert the Windows XP CD in the first computer’s drive. When the XP Welcome Menu appears, click Perform Additional Tasks. Click Setup Home Or Small Office Networking and follow the prompts. Repeat steps 1 to 3 for each computer on your network. Make sure you maintain an active Internet connection on your host computer as you proceed through this process. While running the Network Setup Wizard on the ICS host computer, select the option to copy the Network Setup Wizard to a floppy disk. Once you’ve completed setup on the ICS host, take the floppy to the next computer and insert it in the drive. If you want a really easy networking experience and you have the hardware to support it, consider clean installing Windows XP on two or more computers. First install your network hardware (network interface cards, cabling, et cetera), then perform a new installation of Windows XP. During installation, XP will sense your hardware setup, ask for a name for each computer, and then ask which type of setup you wish to create. Select Typical Settings For A Default Network Configuration. That’s it. Provided your hardware is XP-compatible, XP will create a LAN using the workgroup name MSHOME. The Task Pane in My Network Places lets you access computers on your network and adjust settings. Once you have your network up and running, you can easily access other computers on the network via My Network Places (click Start -> My Network Places). The Task Pane in My Network Places lets you view your network connections and view each of the computers in your workgroup (the workgroup consists of all computers on a network which share the same workgroup name – by default, XP gives all computers on your home network the workgroup name MSHOME, although you can change this if you wish). When you initially open My Network Places, you’ll see icons for the Shared Files folder of each of the active network computers. Click the printer you wish to share. 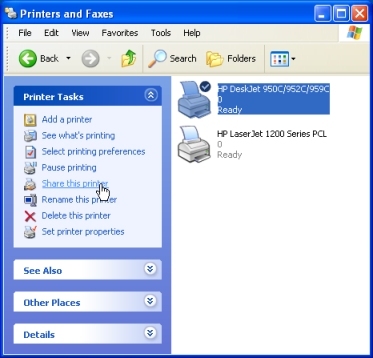 Click Share This Printer in the Task Pane. In the printer’s Properties dialog, click the Sharing tab. Click Share Name and OK.
Make a printer accessible to others on the network by sharing it. Click Start -> Control Panel -> Printers And Other Hardware. In the Add New Printer wizard, when asked whether the printer is a local or network printer, select the latter. In the next screen, select the option to Browse For A Printer and click Next. Select the appropriate printer from the list and continue with the wizard. Open a folder (such as My Documents), click Make A New Folder in the Task Pane and name your new folder. With the new folder highlighted, click Share This Folder. In the Sharing tab of the Properties dialog box, select Share This Folder On The Network. Provide a descriptive name for the folder. This name should make it easy for others on the network to recognise the folder; it doesn’t have to be the same as the folder name you selected in step 1. You can let other people on the network view and edit your files or view them only. If you want to protect your files from tampering, remove the tick from Allow Other Users To Change My Files. Click Start -> My Network Places -> View Workgroup Computers. Click the computer whose files you wish to access and then click the shared folder. You can create shortcuts to shared folders to make them easier to access. Be wary of sharing files and printers if you have an always-on Internet connection. Doing so can make your files vulnerable to outside access. If you do enable sharing, make sure you use password protection, that you don’t share the root (C:\) folder of any computer on the network, and that you install and use a strong, commercial firewall.